New York is a city of a thousand wonders. Not only does it contain some of the most sought after real estate in the world, but it also happens to be an imperial city that is home to a lot of the wealth of the world. For that reason it was really only a matter of time before a resort sprang up in Las Vegas paying tribute to this magnificent city. The New York , New York Hotel and Casino is that resort and it certainly has a lot of things about it that would make you want to spend your Las Vegas vacation at this excellent resort location. 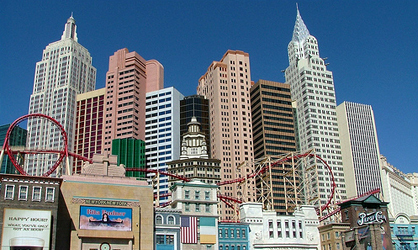 New York , New York Hotel and Casino is located along the world famous Las Vegas Strip. It is on South Las Vegas Boulevard , putting it within walking distance of pretty much every other major resort destination in the city. It is also close to all of the great entertainment spots and most of the great dining and nightlife venues as well. It is a fantastic location for your central base of operations during a Las Vegas vacation and that is one of the main reasons that the resort continues to be very popular amongst the population. The watchword for the accommodations at the resort is stylish. However, within that watchword there are a number of different ways to fulfill a stylish outlook while still making sure that the theme of New York shines through loud and clear. You can therefore get rooms that are plainly designed or you can get rooms that go all out with extravagance and pomp. There are six different groups of rooms available for you to book at the New York , New York Hotel and Casino and therefore you will not be stuck for choice at any point during your resort vacation. If you're looking for a resort that comes with a lot of extras, chances are very good that New York , New York Hotel and Casino is the type of resort that you want. Not only do you have access to a world class casino and fantastic spa amenities, but you can also shop till you drop, take a tour of Las Vegas , play in the video arcade or enjoy a round of golf with your friends and family. If none of that floats your boat, why not take a nice relaxing swim in the massive swimming pool kept on hand by the resort just for people that want to help themselves to some exercise during their Las Vegas vacation. Once the day is done and it is time to unwind, you can take in some performing arts shows and eat some fantastic food. All of this is available without you even having to leave the resort grounds. With all of these great amenities, New York , New York Hotel and Casino has definitively proven to the world that it is competitive in the Las Vegas resort game. Like most of the other great resorts in the city, it is popular for many reasons.